Ask fellow campers about "Indian Pass Campground" and nearby attractions. Campground is dated, no clear delineation between sites. Sights are not well kept up. Example: Cable TV had been "updated" with new wiring and connections, but old wiring and boxes were still present, in various states of disrepair. No sewer. Site had numerous small items of trash, bottle caps, paper, etc present. We called and told them that we would be a little early, they said, fine, the site is open. Then were told when we arrive that there was an "early check in fee" of $10.00. They didn't even pick up the trash in the site. We camped at Indian Pass Campground in a Motorhome. Staff was helpful in making reservations. We told them that we were desiring to stay longer when making the reservations. They called us two weeks out and said there had been a cancellation and we could extend our stay, which we did. Staff were professional. For what they are charging, it doesn't appear that they are putting much money back into the campground. We love this place! So what is Indianpass Campground? Well let's talk about what it is not. If your looking for a open parking lot style RV Park with full hook ups, high speed Wi-Fi, that will fit a 50' Motorhime, then this place is not for you. What is Indianpass Campground? It's a old School Fl. Camp ground, or like I call a fishing camp. It's laid back and cozy, friendly staff, and well kept. Though this camp has been here at least 50+ years. They have waterfront sites, but all of the sites are a quick walk to the beach. Almost all of the sites have some kind of tree cover. The sites have power, water, and most have cable TV. 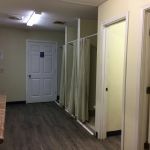 The bathrooms have recently been updated, and are clean and well kept. The grounds are well kept and tree debris is kept cleaned up. Tank pump out service is provided at $15 per pump out. Sure beats dragging a blue boy around. The campground is across from St. Vincent National Island. It's a quick kayak trip across the channel to a little seen Gem of the Fl Coast. There is a ferry service that can also provide access to the island. The Camp is kid and dog friendly, and you can have dogs in the Cabins. Overall? We love this laid back Old Florida style Campground. We camped at Indian Pass Campground in a Travel Trailer. Just a heads up, it's close to the water and windy. This is a CG at the end of the road with a boat launch. Therefore it's quiet, pretty dark, right on the Gulf, and has some ok beaches. CG Basics: roads gravel and a bit tight to get around on if you go down the wrong ones. Sites gravel and depending on where you are pretty roomy and mostly level. Bathrooms and showers were spotless. Shower had good pressure and plenty of hot water. They are wired for cable but it doesn't work. They have no wifi but Verizon and Mifi work well unless a tower goes down, happened when we were there probably due to a prescribed burn on the mainland service was out in the whole area. It was back up the next morning. OTA tv gets 6 channels. All the sites have power and water but not all the sites have 50 amp. Our site had 50,30,20 amp with water. The water doesn't taste that great so you might want to come with full fresh water. No sewer hook up but the have a dump station and pump out service available. W/D are also on site. This was our second time here and we will come back if we're in the area again. We camped at Indian Pass Campground in a Motorhome. Fishing from the beach, Boat Launch access to the Gulf and lagoons, St. Vincent WMA a short boat ride or paddle away. Boat ride rnd trip are available for $10/head. Excellent sea food restaurant 3 miles away "Raw Bar" only about 15 miles from St. Joe Peninsula State Park. If you're looking for easy access to shopping, dinning etc. this is not for you. Port Saint Joe is about 12-14 miles away and Apalachicola is about 20. What you get is a Florida Gulf coastal access without: impossible traffic, endless beach supply stores, mini golf, or long lines. You're a about a 1/4 mile away from St. Vincent WMR across Indian Pass. A short paddle in a kayak or a shuttle service is available for $10 rnd. trip. The island has 8 mi of shoreline with nothing there except the island and lots of hiking on old roads through multiple coastal environments. There's an excellent seafood restaurant 3 miles up the road. Beautiful views. Very quiet. Very pet friendly. Clean restrooms and showers. Lots offer some shade. Site surface is sand and features a fire ring and picnic table. We camped at Indian Pass Campground in a Motorhome. The location is nice, right on the water, and the staff is very friendly. We knew going in that we were in a 'fish camp' environment and were ok with that. However, we felt the prices were a little high for what you get. Sites are a little tight, although our view was wonderful. The park seemed a little run down and dirty, which lead to our lower review. 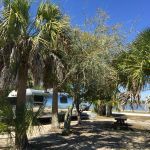 We camped at Indian Pass Campground in a Travel Trailer. Great little restaurant right down the road though....Indian Pass Raw Bar. Check rates, ours was the prime A11 site overlooking the bay. Listed at $42, but we paid $33. Just large enough for our 35' Class A. Sand and gravel lots. Watched dolphins and pelicans from our window everyday. A fishing camp with old Florida style. 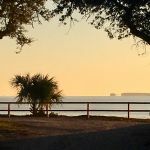 Located at the dock to St. Vincent National Wildlife Refuge and less than thirty miles to St. George, St. Joseph beaches and Apalachicola sites. We camped at Indian Pass Campground in a Motorhome. Great camping if you want casual, less developed area. It is not for everyone as it is not cement and landscaped but it is a great natural setting. I loved being so near the water. Short drive to nicer beachs for the sun lovers but for relaxing and fishing this is a great spot. Heading back for a week end of September! 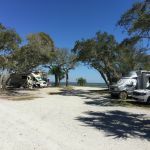 We camped at Indian Pass Campground in a Motorhome. We stayed at this campground for 5 months. At first the quaintness appealed to us, and the fishing was good. However, this campground is poorly managed. The grounds are not cleaned after storms, and gray water is allowed to disperse on the ground from longer term campers. They will dump your sewer with a 'honey wagon' once a week before the honey wagon broke down. The managers made no attempt to begin repairs for several days. My husband had to help them work on it. The water is treated with chlorine and has a bad taste. They say they have internet but it's not in the whole park, just a few front sites. They had an argument with the cable TV company and we had no cable for several weeks. We finally installed our own satellite. The bathrooms were kept very cold for showers in the winter, no heat for much of the time. The managers have a total disregard for their clients except when it is time to take in money. They take reservations for sites but when you get here they have given it to someone else. There is no one on-site to help with parking or problems. The sites are not level. Also: the complaints from previous reviewers are very true. This is glass on the beach. The actual Indian Pass has a very strong current and is only for fishing. This campground is very windy and much colder than we expected for the winter. We camped at Indian Pass Campground in a Travel Trailer. They take "reservations" but do not reserve spots. Two families with 5 kids traveled 4 hours to camp together and were assured 3 weeks before when making the reservation, that getting spots together would not be a problem. That did not happen! Oyster shell beaches and shark infested waters. No bike trails. However, the staff were nice and polite. The locals are great. If you like scalloping, this is the place to be in July and August. The Raw Bar is a must stop. The steamed shrimp, stuffed shrimp, and baked oysters were fabulous! Presnell's Bayside Marina is closer to town with most sites on the water. We camped at Indian Pass Campground in a Motorhome. Great location. Old fish camp with haphazard site arrangement. If you have a big rig, be very careful to walk to your site first and check for potential dangers. We got a good site for our 40' MH, but the 40' that pulled in next to us at night got stuck in deep sand and we spent all night helping them dig out the rig so the commercial tow truck could pull them out (hours of digging in sweltering heat and bugs with every breath.) Beach right at campground is beautiful sight, but loaded with broken glass - do not even think of swimming there or walking without solid shoes - for some reason the bottles tossed overboard by the boats all come to this area. Nice area to walk around, ladies who run office are lots of fun, pool is heated and shaded and generally clean. Bathrooms fall just at OK. Nice place to rest under the trees and away from everything. Gorgeous state beaches for swimming a short drive away. Long ride back to stores. I wouldn't risk it with kids due to dangers and lack of kid things to do. Think redneck fishing camp that lets in RVs. You need good driving skills to stay here. Arrive early in day as you get to pick your spot - not many for bigger size rigs. You might be next to a tent - we met lovely people tenting next to us. We camped at Indian Pass Campground in a Motorhome. Are you affiliated with Indian Pass Campground ?